You may have heard the term “continuity program” if you have ever ordered beneficial insects from ARBICO. You may have also asked, “What does that even mean?”. In the context of using beneficial insects, continuity refers to a continuous schedule of releases. As an important part of a well-planned integrated pest management program multiple, sequential releases of beneficial insects can make the difference between success and failure. While many issues can be prevented by using proper cultural growing practices, every healthy garden will have some pest insects. We can't have the beneficials if they don't have the pests to consume. If they are causing significant damage, action must be taken. For the purpose of this blog, we will use the example of how to control aphids in the garden with beneficial insects and the importance of continuity to achieve successful control. So, we've identified that we have aphids and want to use some good bugs to fight them. One of the best predators in nature is the Green Lacewing - nicknamed the Aphid Lion for good reason. If we can build up a sustainable population, green lacewing are our best bet to control the problem throughout the growing season. It is important to note the biology of our chosen treatment. Adult green lacewing and their pupae do not feed on pests - the newly hatched larvae are exceptional predators. Understanding the benefits of each life stage and how they play into continual releases (a continuity schedule) of the green lacewing makes a difference in how successful we will be. Week 1: Release eggs into the growing area. Eggs hatch into little alligator-like larvae within one week. These larvae, the “aphid lions” roam the plant looking for eggs, nymphs and adult aphids to eat. Week 2: Larvae are roaming the foliage, feeding on their favorite prey as they grow. 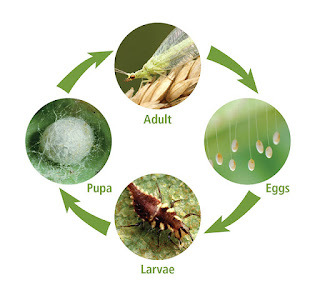 Aphid control has begun as the lacewing larvae continuously feed. Week 3: Larvae are still feeding, but some may be getting ready to pupate. Time for another release of eggs. The second release helps us avoid a period where there are no predatory insects actively feeding. Aphids are some of the fastest reproducing bugs, so we want to release our good guys with that in mind. Week 4: First release is ready to pupate into adulthood as the second round of eggs hatches into the predatory larvae. We have successfully avoided a gap in our control by staggering the life stages of the good bugs. Week 5: Adults emerge from pupae as the second round of larvae grow and feed. Time for one more round of eggs. This third release helps buffer the larvae population still feeding. Week 6: Adults begin pollinating while the second round of larvae ready for pupation. The third release will begin to hatch, prolonging control. By this time, adults should be laying eggs in the growing area and we have our controls in place. Now it is time to monitor, monitor, monitor! We don’t need to worry about aphids developing resistance because we are using a natural predator, but our job is not done. If we haven’t already, this is a great time to engage in another swtep of IPM and place yellow sticky traps around plants. It is also time to revisit our treatments, growing practices and any notes from past growing seasons. Should we expect another pest? Is there anything we are doing that contributes to the aphids’ arrival? How can we avoid the problem in the future? Pest control is never fully complete in organic gardening and the best practice is continued diligence when issues arise. While we have only covered one type of insect release today, the same principles apply to other insects, spray programs and fertilizing plans. We don’t want the plants or the pests to be working in a vacuum and we can successfully plan for the future the more involved we get. If there is ever anything that is perplexing, out of the ordinary or downright wrong with your plants, call us at ARBICO and we can help you identify a path to success! Our knowledgeable sales representatives have backgrounds in organic growing, biological control and sustainable agriculture and are happy to share their knowledge with you! Soil Amendments: When You Know Your Soil Needs Something…. What The Heck Is That Monstrosity? © Copyright ARBICO Organics. Simple theme. Theme images by konradlew. Powered by Blogger.